The Edgar Allan Poe statue sitting in the Gordon Plaza at University of Baltimore has a colorful past. 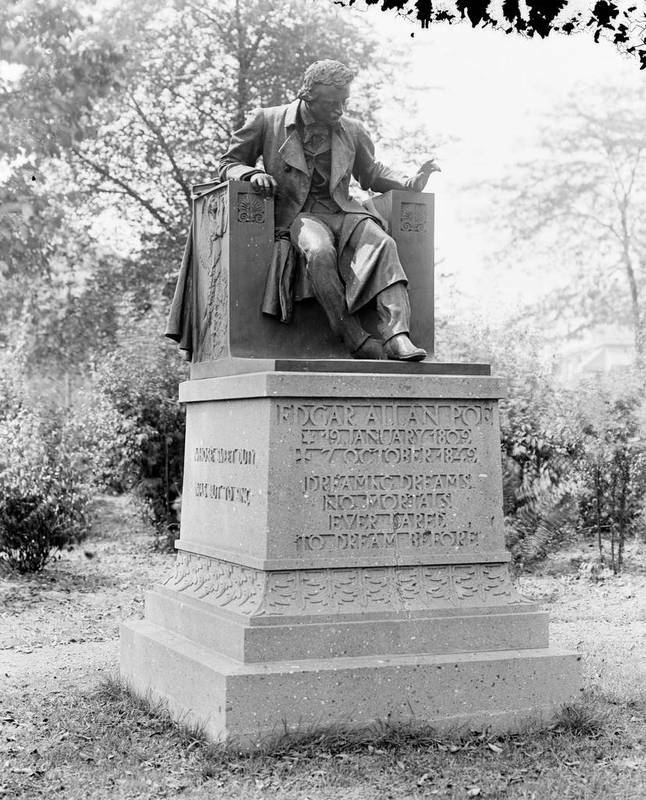 The statue was commissioned in 1911 by the Edgar Allan Poe Memorial Association of Baltimore and was the last work of renowned American sculptor Moses Jacob Ezekiel. Born in Richmond, Virgina, Ezekiel was a decorated Confederate soldier who moved to Europe in 1869 and, in 1910, was knighted by King Victor Emmanuel III of Italy for his artistic accomplishments. The Women's Literary Club established the Edgar Allan Poe Memorial Association in 1907 and hoped the statue would be completed for the centennial of Poe's birth in 1909, but a lack of funds, a series of mishaps, and poor timing delayed the statue's arrival in Baltimore until 1921. Ezekial completed the first model in 1913 but a fire at a custom house destroyed the sculpture en route to a foundry in Berlin; the second model, completed in 1915, was destroyed in Ezekiel's studio by an earthquake; and the third model, completed in 1916, was due to be shipped across the Atlantic, but was delayed another five years due to World War I. By the time the statue arrived in Baltimore, Ezekiel had already been dead for four years. After the statue's arrival in Wyman Park during the summer of 1921, more complications arose. 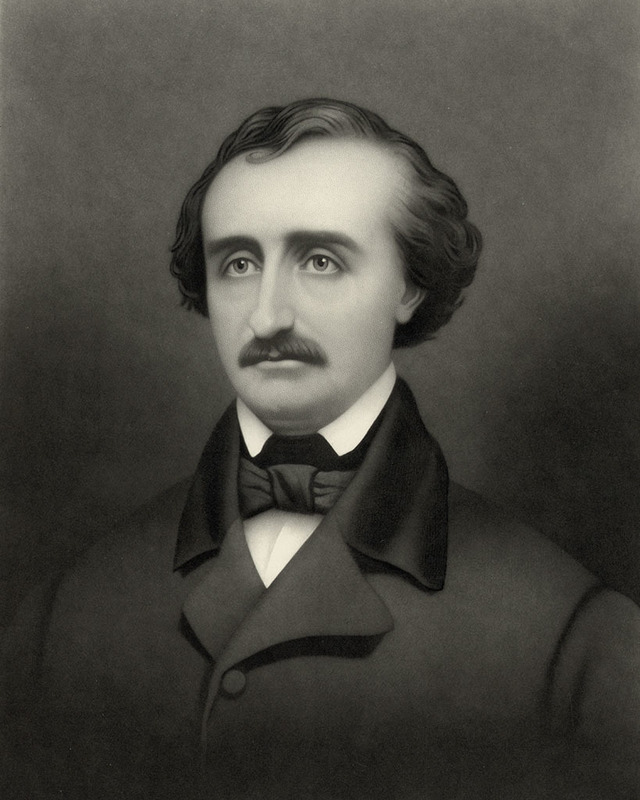 The inscription, a quote from Poe's famous poem "The Raven," had two typos and read: "Dreamng(sic) dreams no mortals(sic) ever dared to dream before." 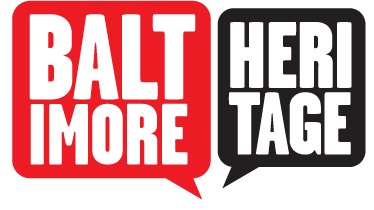 In 1930, Edmond Fontaine, incensed over the typo on the word "mortal," came to the park in the middle of the night and chiseled away the incorrect "s." The police arrested Fontaine for his vigilantism but he was never prosecuted. Over the years the Poe statue suffered from neglect, vandalism, and weather damage. 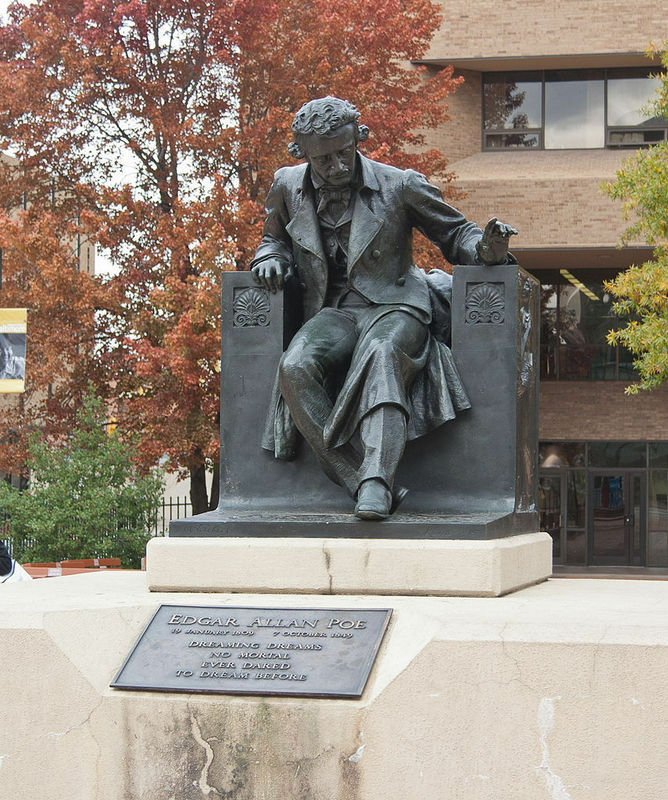 In 1983, the Edgar Allan Poe Society of Baltimore recommended the statue be moved to the Gordon Plaza at the University of Baltimore where it still stands today. The statue has become a mascot of sorts for the university, and during the NFL playoffs it can be seen bathed in a purple light in support of the Baltimore Ravens, a team named after Poe's famous poem. 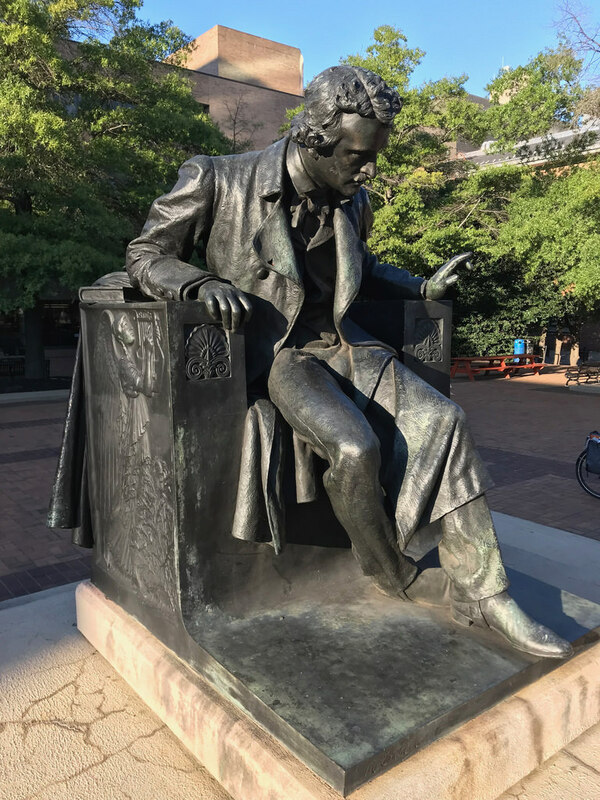 Nathan Dennies, “Edgar Allan Poe Statue,” Explore Baltimore Heritage, accessed April 23, 2019, https://explore.baltimoreheritage.org/items/show/185. Krainik, Clifford. "The Sir Moses Ezekiel Statue of Edgar Allan Poe in Baltimore." Published on Feb 7, 2013. Last updated on Nov 27, 2018.